Soft nose provides added durability in the case of a hard landing or crash. Nothing as exciting as Anti-Crash Technology (ACT) has happened to entry-level radio-controlled planes since HobbyZone was introduced. the plane. This causes the nose to come up and pulls the plane out of the dive to help prevent the plane from crashing. The pilot is then able to regain control. If pilots are flying correctly and do not put the plane into a severe dive situation while ACT is engaged, they will have complete control of the plane’s flight pattern. Once users gain experience flying, they can turn ACT off. (HBZ3510). Because flying at night is very difficult, you should be quite experienced before you attempt to use this module and the ACT software should be shut off. For more information about these exciting modules, please search for them at www.horizonhobby.com. 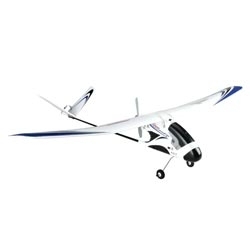 If you are new to RC flight, check out our new Blog, The Runway. Everything you need to get your Firebird Commander 2 in the air is included in the box!